From time to time Thoughts That Go Bump in the Night will comment on a movie that, well, presents thoughts that are charming, insightful, inspirational, and so on. If you haven't already, enrich your Christmas experience with Hugo. Asa Butterfield plays young Hugo Cabret, a natural tinkerer and fixer of broken machines. But Hugo is now an orphan and, in Paris, orphans are shuttled to orphanages rather than litter the streets. While dodging the authorities, he enlists Isabelle, Chloe Grace Moretz, to help solve the puzzle of an automaton - a mechanical man - Hugo believes has a message from his late father who attempted to fix the broken machine. That's about as far as I can go without spoiling the absorbing plot. Suffice to say that Ben Kingsley had to play his part. 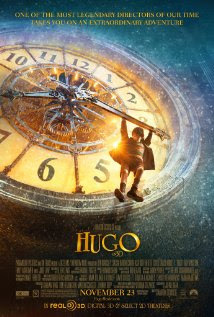 The movie is magic and derives much of that magic from the early motion pictures - it's really a history of movies - and like the clocks that dominate the station, the characters who people the station move in their own stories and romances mirroring Hugo's quest. It's a treat. Enjoy yourself.